Find the rounding error below, where someone tried to round 478.3469 to different place values. Find all twelve factors of 60. Which has more factors, 36 or 40? Round 1.27272727... to the nearest tenth, hundredth, and thousandth. Twelve times a number equals 30⁄55. What is the number? It is time to talk conceptually about division. There are two ways to think about division. Unfortunately, most people are only taught one way and this causes people to get stuck. The first way to think about division is dealing out cards. If I want to model 6 ÷ 3 = 2 then I act out having six cards, and dealing them out to three people until I am done. Model 6 ÷ 3 = 2 by dealing out cards. 6 becomes the number of cards total. 3 becomes the number of piles. 2 becomes the number of cards per pile. Unfortunately, this way of thinking does not help with dividing by fractions. Deal out cards to model 6 ÷ 1/2 = 12. We get stuck! How do we deal cards to half a pile? What is "half a pile" anyway? The second way to think about division is making piles of a fixed size. If I want to model 6 ÷ 3 = 2 then I act out having six cards, and dealing them out them out into piles of size 3 until I am done. Model 6 ÷ 3 = 2 by making piles of a fixed size. 3 becomes the number of cards per pile. 2 becomes the number of piles. This way of thinking does help us think about dividing by fractions. Model 6 ÷ 1/2 = 12 by making piles of a fixed size. 12 becomes the number of piles. The second way of thinking also allows us to understand why division by zero, which is undefined, is in a few situations treated as if the answer is infinity. If I had some cards and tried to make piles of size zero I can do this easily. I just never stop! Your turn to work out two more examples of fraction division. Model 4 ÷ 1/2 = ? by making piles of a fixed size. Model 1/2 ÷ 1/4 = ? by making piles of a fixed size. 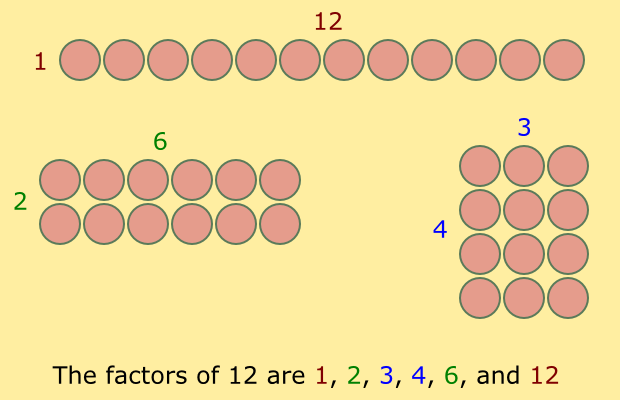 Factors are the numbers you multiply to get another number. Some students find it helpful to think about all the ways to make a rectangle with blocks or coins. Note that 1 and the number itself are always factors! The traditional way to memorize common factors is to use flash cards. But it is more fun to play the Factor Game! Here is a copy of the game board to use with an in-class demonstration. Rounding a decimal is reducing the accuracy of a decimal by removing the digits of tiny place value, and perhaps incrementing by 1 the smallest remaining place value digit. Consider rounding to the hundredths place. Any digits of place value to the left of hundredths stay the same. (So the whole number digits and tenths digit are unchanged.) Any place value digits to the right of the hundredths digit are removed. The hundredths place digit might go up by 1. This happens if the digit to its right, the biggest of those removed, was 5 or more. Round 1.95283 to the nearest... tenth? hundredth? thousandth? ten-thousandth? Round 5.749507 to the nearest... tenth? hundredth? thousandth? ten-thousandth? Chapter 1 Test, Problem 20: Round 34,528 to the nearest thousand. Chapter 1 Test, Problem 21: Round 34,528 to the nearest ten. Chapter 1 Test, Problem 22: Round 34,528 to the nearest hundred. Chapter 4 Test, Problem 14: Round 5.6783 to the nearest one. Chapter 4 Test, Problem 15: Round 5.6783 to the nearest hundredth. 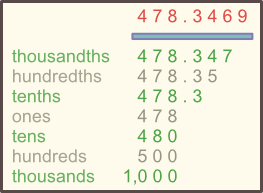 Chapter 4 Test, Problem 16: Round 5.6783 to the nearest thousandth. Chapter 4 Test, Problem 17: Round 5.6783 to the nearest tenth. When we do math (especially with a calculator) we often get answers that have long decimals. For example, the problem 40 ÷ 7 = 5.7142857... has a long decimal merely because we did division. With how many decimal places should we write our answers? This question is actually more about philosophy than mathematics. Let us consider a few cases. In all these cases we will show that we changed the answer by using the about equal sign, which is written like ≈. If the situation requires a certain number of decimal places to be useful, round appropriately. If the amount cannot be divided into meaningful parts, drop or round the decimal digits appropriately. Otherwise, communicate how precisely values were measured by adding no more than one decimal place. Perhaps I have a 40 inch board, and I need to cut it into seven equal lengths. When doing carpentry with a tape measure I can only measure to tenths or hundredths of an inch. It does not make sense in this situation to use more decimal places. With the carpentry example, our tools limited our accuracy. This happens often in real life, but not often in Math 20 word problems. Perhaps I have a six guests coming to my kid's birthday party, so I need to put 40 pieces of candy into 7 bags of party favors. I do not want to cut pieces of candy into pieces. To avoid having kids argue I should just drop the decimal entirely. In the bags of candy example, our answers needed to be whole numbers. This is very rare in Math 20 word problems. Imagine that a pharmacist has about 40.0 mg of a medicine and divides it into 7 doses. This measured value was not notably precise: 40.0, not 40.0268 or 40.00035. We should not add more than one decimal place. We do not want to pretend we have more accuracy than we do. With the pharmacist example, our tools were not what limited our accuracy. A chemist's scale can measure much more accurately than one-tenth of a milligram. Instead, our initial accuracy was what limited us. We cannot gain accuracy just by doing division! In Math 20 word problems this is the most common guideline for rounding. Your turn to do an example. With a yardstick I measure that a cardboard box is 15/16 of a yard tall. Write this fraction as a decimal and round appropriately. Normally we do not round in the middle of a problem. By waiting until the end, we avoid introducing error. Let's consider a few examples. In Eugene it rains, on average, about 1.15 inches per week. If we rounded, the difference is noticeable! That difference of 7.8 inches would matter a lot if you were a farmer, or planning the storm drain system. You do assistant contractor work that earns a little over $1,000 per month after taxes. You work for 3 months and 1 week, then have time between jobs, then work for 5 months and 1 week. If we rounded first, the difference is significant! You are a realtor who earns a 0.06 commission. You sell a house for $210,000. Your turn. Work with a partner to invent a word problem. Solve it accurately, doing any rounding at the end. Then round first, and see how much the answer changes. Rounding at the very beginning of a problem is called estimating. As we have seen, this can change the answer a lot. But it can be a very helpful thing to do as a quick "check" after we finish a problem. Is our answer close to the estimated amount? If not, we probably made a careless calculator mistake and can go back to find what went wrong. Estimate the answer to 47,900 ÷ 12 before using a calculator to do the problem. Chapter 1 Test, Problem 23: Estimate the sum 23,649 + 54,746 by first rounding to the nearest hundred. Chapter 1 Test, Problem 24: Estimate the difference 54,751 − 23,649 by first rounding to the nearest hundred. Chapter 1 Test, Problem 25: Estimate the product 824 × 489 by first rounding to the nearest hundred. Chapter 4 Test, Problem 39: Estimate the product 8.91 × 22.457 by first rounding to the nearest one. Chapter 4 Test, Problem 40: Estimate the quotient 78.2209 ÷ 16.09 by first rounding to the nearest ten. When exponents are whole nubers they are merely shorthand for multiplication. This even works if the number under the exponent is not a whole number. The dots show the values when x is a whole number. The first dot shows 21 = 2. The second dot shows 22 = 4. The third dot shows 23 = 8. The fourth dot shows 24 = 16. The fifth dot shows 25 = 32. The line shows all the other places that fit the pattern. So we can look on the graph and see that 23.6 ≈ 12. A more carefully drawn graph allows reading a better value. Using a pattern to solve a formula is called interpolation. Most calculators do exponents with a key that looks like yx or ^. Even those calculators that use a yx key often represent the exponent with the ^ symbol in the display window. Many math students are taught to memorize the acronym PEMDAS to help solve resolve order of operations. Unfortunately, PEMDAS can cause problems. To solve an order of operations problem we cannot simply do P-E-M-D-A-S in order! This is because some operations have equal priority. These must be done left-to-right when only these are left to do. Simply looking at the acronym PEMDAS does not tells us that multiplication and division have equal priority. Stay alert! We need to work out this problem left to right. If we try multiplication before division we get the wrong answer. Also note that PEMDAS does not tells us what to do with fractions. Fraction bars are actually another grouping symbol, just like parenthesis. We could rewrite fractions problems as parenthesis problems. Thus to salvage PEMDAS we need to rewrite it a bit. Parenthesis and fraction bars have first priority. Then exponents. Then multiplication and division. Then addition and subtraction. Work from left to right with items of equal priority. The best way to deal with order of operations is to not use anything like PEMDAS at all. Instead of the (AS) step think about terms. A term is an expression separated from the equal sign only by addition or subtraction. Why are terms the easiest way to think about order of operations? First, each term is totally independent until as the very last step we combine them. It does not matter which term we simplify first. Second, within a term we only have two priorities: first grouping structures (parenthesis, fraction bars, and exponents) and then going left-to-right with multiplication and division. How are exponents a grouping structure? Well, they come with a sense of grouping. These three expressions are not equal! What is a Negative Number? Negative numbers are less than than zero. −5 is less than −2 even though 5 is more than 2. A number line can help keep track both whole numbers and numbers with decimal digits. Find 3.5 and −2.8 on a number line. To add and subtract with both positive and negative numbers it is helpful to think of money. A positive number is like how much money is in your hand to spend. A negative number is like a debt you have promised to pay. One technique is to try making up a story to go along with each addition and subtraction problem. "I have $30 in my hand and am going shopping. I know that I owe my friend $12. A debt has been added. So in my mind I plan my shopping as if I had only $18, because that debt means $12 of the $30 is not mine to spend." "I have $30 in my hand and am going shopping to spend $18 because I owe my friend $12. But when I finally see my friend he says, 'Never mind the debt. It's been seven years anyway. Just keep the $12.' A debt has been removed. So I change how I think about the money. I don't have only $18 to spend, but all $30." Instead of a story, you can also use a number line to keep track of adding and subtracting with both positive and negative numbers. Remember from the equation 18 − (−12) = 30 that subtracting a negative worked just like adding. I get more money, whether I am paid or have a debt subtracted away. There is a saying that goes "a negative of a negative is a positive". Why is this true? Imagine that the front wall of our room is a number line. Zero is in the middle. Now we need a student to volunteer to show us by walking the values of +3 and −3. Draw a number line. Have a volunteer stand at "zero", facing positive, before continuing. How would our volunteer show us +3? He or she would walk forward 3 steps. Note that this location along the front wall represents +3 on our number line. How would our volunteer show us −3? He or she would walk backwards 3 steps. Note that this location along the front wall represents −3 on our number line. How else could our volunteer show us −3, without any backward steps? He or she could pivot 180 degrees, and then walk forwards 3 steps. Note that results in the same location along the front wall representing −3 on our number line. What happens if our volunteer does both kinds of negative? That is, if he or she represents −(−3) by both turning around 180 degrees and then taking three backwards steps? Our volunteer winds up at the +3 location on our number line. This is another way to see that − (−3) = 3. Using arithmetic, a number is made negative by × (−1). Variables are Neither Positive Nor Negative! Consider the expression 10 − x. If we plug in x = 20 then we get 10 − 20 = −10. If we plug in x = −20 then we get 10 − (−20) = 30. So, is the expression 10 − x positive or negative? It depends upon what we plug in to x! In general, it does not make sense to say that x is positive or negative. It depends upon what we plug in to x. This is why in college math we write −5 instead of −5. Once we use variables instead of normal numbers, then every time we see a − sign we are subtracting, but it might not be negative! That is a very weird statement! Once we use variables instead of normal numbers, then every time we see a − sign we are subtracting, but it might not be negative! Compare the mathematical expressions 5 − x and 7 − (−x). Both involve subtraction. Neither necessarily involves a negative amount.